E. Alex Pierce has been published in many Canadian journals and anthologies and is the author of Vox Humana. E. Alex Pierce lives in East Sable River, Nova Scotia where she is developing a centre for writers and artists. In her earlier life she taught voice, movement, and mask for the theatre, and created original collaborative works with visual artists and composers. For ten years she taught creative writing (playwriting & poetry) at Cape Breton University, and is currently Series Editor for the CBU Press publication, The Essential Cape Breton Library. She holds a Master of Fine Arts in Creative Writing from Warren Wilson College, and has been a participant in the Writing Studio at the Banff Centre and in the Poetry Colloquium at Sage Hill. She has published in Arc, The Fiddlehead, CV2, and The New Quarterly. 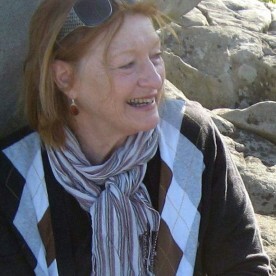 Her work has been in anthologized in Words Out There: Women Writers in Atlantic Canada (Roseway); Best Canadian Poetry 2008 (Tightrope); and in Undercurrents: New Voices in Canadian Poetry (Cormorant). Her book, Vox Humana, was published by Brick in 2011.